It appears that the latest must-have feature on luxury watches isn't dozens of tectonic plates; dinosaur bone fragments or the kitchen sink—it's the ability to stop the time. Imagine harried Russian oligarchs allowing their mistresses a few minutes of untimed sexytime. 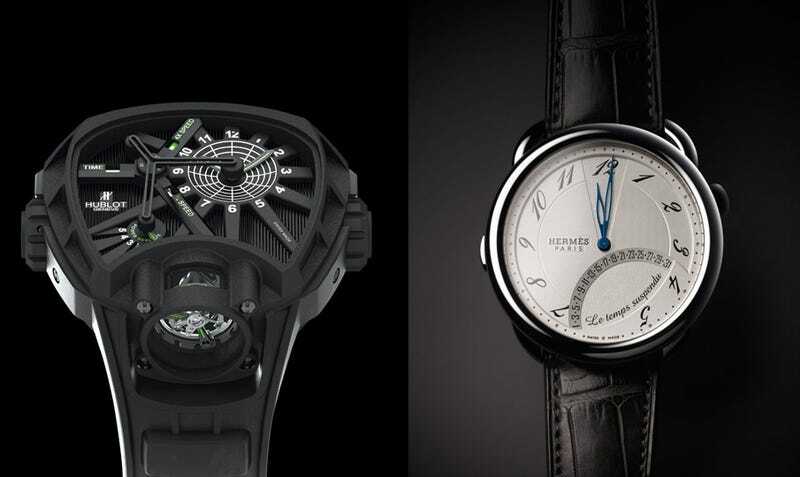 On the right, we have the Hermès Le Temps Suspendu watch, which promises to "suspend time" with a click of a button. As the movements continue working after the button has been pressed, the hands will whizz back to the accurate time after however long is needed "off the grid." That faux sense of freedom? It will cost you $19,600. The less business-like and more-extreme looking one on the left is the Key of Time by Hublot, whose CEO Jean-Claude Biver explained that the "value of a watch is not to give you time. Any five dollar watch can do that. What we are offering is the ability for example to stop time or make it disappear... Time is a prison and people want to get out of it sometimes."